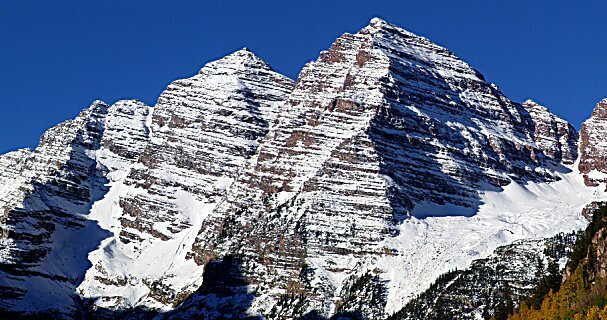 Two skiers stranded near South Maroon Peak were rescued Monday night after a Flight for Life helicopter brought them to safety, the Pitkin County Sheriff’s Office said in a press release issued Tuesday afternoon. The sheriff’s office did not release the names of the skiers, one of whom was an injured female. The rescue came after the Gunnison County Sheriff’s Office received a GPS alert from the skiers shortly before 1 p.m. The info was relayed to Pitkin County authorities. Later, the Flight for Life helicopter dropped off six mountaineer-rescuers about 1,500 feet below the injured woman. The rescuers made their way to the victim and lowered her with ropes and snow anchors to the landing zone, the Pitkin County Sheriff’s Office said. Both the patient and her partner were airlifted at approximately 7 p.m.
Members of Mountain Rescue Aspen, Flight For Life, Aspen Ambulance and deputies from the Pitkin County Sheriff’s Office were involved. The summits of the 14,156-foot Maroon Peak and the 14,014-foot South Maroon Peak are located approximately 10 miles south of Aspen.